The conference included seminars and presentations by the leading MD’s, DO’s, PhD’s, and pharmacists in the field of age management. Topics included regenerative and cell-based medicine, nutrition, hormones, alternative medicine therapies for stress, pain, and insomnia, and office-based aesthetic medicine. The International Cellular Medicine Society (ICMS) held their second annual conference in conjunction with the AMMG’s, which included a one-day training course in the collection, isolation, and therapeutic uses of adult mesenchymal stem cells (MSC). These stem cells are being harvested from bone marrow, adipose tissue and peripheral blood and either used after minimal manipulation or after being cultured and activated by various growth factors. Some physicians are treating patients with stem cells harvested from umbilical cord blood, especially for neurological and inherited diseases. Presentations were given outlining the research and clinical practice ongoing in the field of regenerative medicine which included the therapeutic use of MSC for resurfacing articular joints, regenerating muscle tissue, improving heart function with patients with heart disease, reversing degenerative disc disease and improving function in Parkinson’s patients. Medical/legal aspects of the various therapies were discussed, especially topical were the presentations given by Christopher Centeno, MD, and his legal counsel, regarding the ongoing legal proceedings between the Centeno-Shultz Clinic, which he partners with John R. Schultz, MD, DABPM, and the FDA. Their clinic in Colorado has been treating patients with autologous stem cells. They have protocols for the harvest, culture in vitro and activation with growth factors and other agents of the patients’ own stem cells for use in the regeneration of joint tissue. Similar concepts have been used for decades in the practice of in vitro fertilization, but FDA has not approved stem cells for any use. The main point of the suit is that the FDA is trying to regulate the practice of medicine, which numerous court rulings have shown that it has no jurisdiction to do. The practice of medicine is under the individual states’ medical licensing boards. The “practice of medicine” concept allows, for example, for individual doctors to prescribe medications for off-label use, alter a surgical technique, or modify a medical instrument for specialized purpose, if what the doctor is doing has a reasonable expectation of having positive clinical outcomes and poses little or no increased risk to the patient. * (To see Dr. Centeno’s article relating to this issue, please refer to: Centeno C. Our patient’s autologous stem cells are drugs: the FDA moving down a dangerous slippery slope. Journal of Prolotherapy. 2010;2(4):477-479.) The FDA’s position is that “manipulation” of the stem cells may cause a risk to the patients. Their take is that stem cells may become tumorigenic, that is, turning into cancer cells. So while all the procedures, growth factors, blood thinners, culture media, all have been approved at some point by the FDA for other uses, they do not want them used with stem cells. This has put clinics like Centeno/Schultz’ in limbo as the FDA has refused to look at the stem cells after they have been manipulated, whether after a process such as they use, or even after a truly minimally manipulative process such as exposing them to various spectrums of light for activation. There are many more issues involved in this case: interstate commerce, infection control, and control of the labs doing the culturing, to name a few. In short, Centeno/Schultz agreed to stop culturing and manipulating the harvested stem cells and to just use them only in a harvested and concentrated form with the understanding that the FDA would go to court to resolve the issues, instead of leaving them hanging in regulatory limbo. It is expected in six to 18 months that this issue will be decided. 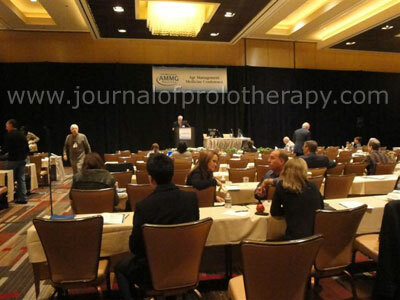 Age Management Medicine Group conference setting in Las Vegas. Their counsel made a very good point, however, that if they are to argue that this issue is under the jurisdiction of the individual state’s medical licensing and regulatory boards, then the doctors involved in the therapeutic use of stem cells had better strictly follow the guidelines set forth by their own state, or open themselves up to lawsuits. At this point, some states have pretty clear-cut guidelines to follow, such as New York regarding banking tissues, while others have little or no oversight in stem cell treatments. There is a similarly named organization to the ICMS, called the International Society for Stem Cell Research (ISSCR) which reportedly is sending out to clinics promoting stem cell therapies on their own websites questionnaires for self-reporting their protocols. There is a conspiracy theory of how the ISSCR is a puppet of the mega-pharmaceutical companies and will use that questionnaire to report the clinic to the FDA. The ISSCR is a proponent of the continued funding of NIH studies researching embryonic stem cell therapies, while the ICMS considers the research in this field a dead-end because of the cancer risk associated with these types of stem cells. They feel that the issue is further clouded by the public’s perception that embryonic stem cell and adult autologous stem cells are the same, resulting in a furor over the use of “embryos” for treatment and research and the perceived cancer risk with all stem cells. Another theory of conspiracy theorists is that the FDA has not allowed adult MSC research and clinical treatments to move forward because of the influence of the pharmaceutical industry. They believe “Big Pharm” is behind the research curve and is afraid that these non-patentable MSC’s will be able to accomplish the same things they are working on presently with patentable embryonic stem cell lines that have had their genes altered, thus making it a patentable product. Like stem cell therapies and research, bio-identical hormone replacement therapy has sometimes been misunderstood by the professionals in the field, the mainstream media and thus, the public. Doctors who practice bio-identical or “natural” hormone replacement therapy (NHRT), and the pharmacists and researchers who support them are still vilified regularly, mostly based on a few research studies that were done 20 to 40 years ago, linking hormone replacement with breast cancer and prostate cancer. Many of the speakers addressed these old studies, addressed some newer research claiming the same links to cancer and hormones, then proceeded to debunk these studies. For every negative correlation between cancer and hormones, literally dozens of research articles in peer-reviewed journals were presented that showed a decreased risk of cancer with the correct use of NHRT. The popular media never make clear the distinctions between pharmaceutical hormones and NHRT according to some of the conference presenters. It was brought up that a significant percentage of urologists over the age of 50, for example, never support the use of testosterone in men except in rare circumstances, based a small sample study done 20 years ago showing an increased risk of prostate cancer with testosterone use. It was explained that “seminal” study looked at geriatric men in failing health in a nursing home where a large percentage of them were not even ambulatory. The speaker went on to point out that many of these men would have developed and/or died from cancer with or without testosterone replacement. This was one of the main points of the hormone discussions, that patients will get cancer and other negative health conditions, but few if any studies show a causal link between NHRT and cancer, if in fact, most of them show an inverse correlation, meaning maintaining healthy physiologic levels of hormones in patients reduce the risk of cancer. Overall, the AMMG conference was well organized and executed, with opportunities afforded for networking, acquiring continuing education credits and learning about new products offered from various vendors. To learn more about the Age Management Medicine Group, visit: www.agemed.org.